One of the cool things about the Eagle Scout Award is that every Scout’s path to earning it is different. Although the requirements for Tenderfoot, Second Class, and First Class are highly structured, those for Star, Life, and Eagle leave plenty of room for personal preference. Even on the list of Eagle-required merit badges, Scouts can make several choices. The result of all this is that an Eagle Scout’s merit badge sash and patch blanket are nearly as unique as his fingerprints. The same should be true of his Eagle court of honor. Even if you use an off-the-shelf script–like one of the eight included in The Eagle Court of Honor Book–it’s vital that you add enough personal flavor that the audience knows something about the honoree. One way to do that: think of three or four words that describe your honoree and build a theme for the court of honor around them. Is he the ultimate outdoorsman or a reluctant camper? Is he a born leader or a practical joker? 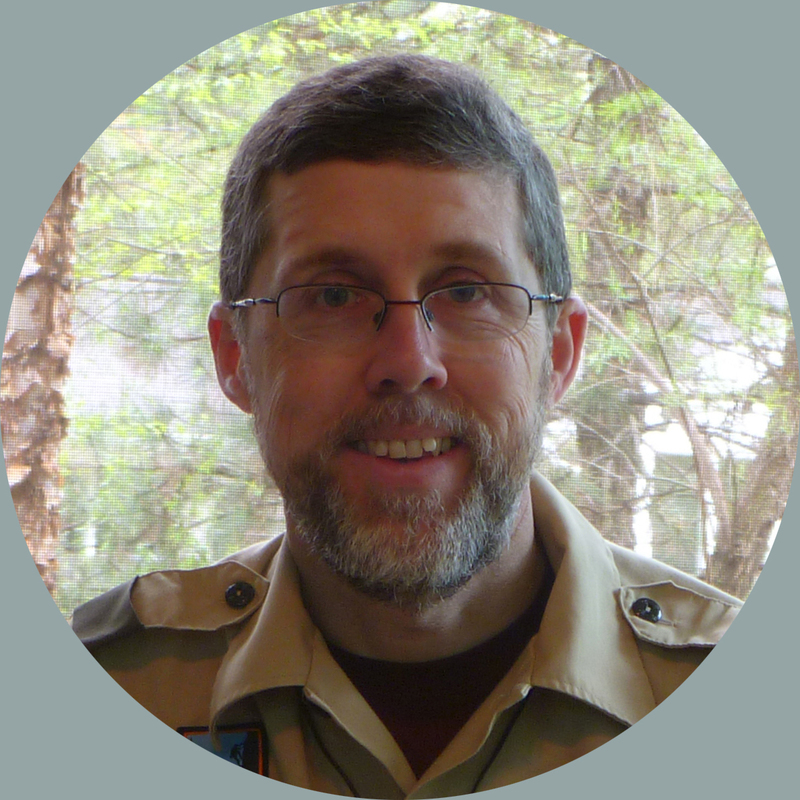 Did Scouting help him overcome shyness and awkwardness or did it introduce him to a lifelong hobby? Is he the first Eagle Scout in his family or the latest in a long line of Eagles? Figure out what makes him unique, and you’ll be well on your way to crafting a ceremony that celebrates his unique journey. Now that June is just around the corner, your unit’s summer plans are (I hope!) nearly complete. But what are you planning to do next summer–and the summer after that? 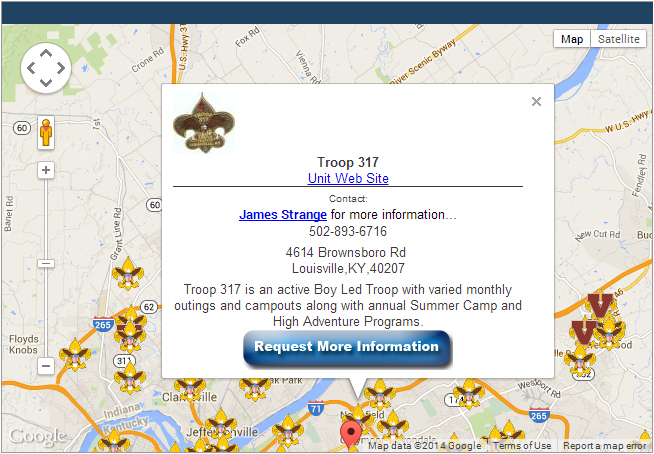 The BSA has recently introduced a tool to help you find the right Scout camp for your troop. 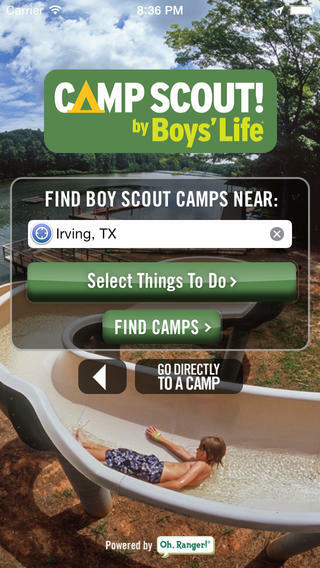 Called Camp Scout!, the free iOS app lets you find Scout camps near your location–or any other location you choose. Simply enter your city and state or ZIP code and click Find Camps, and a list of camps in your vicinity pops up, sorted in order of proximity. Then, click on a camp name for directions, contact information, a list of available activities, and a description of the property. You even navigate to the camp using Apple’s Maps app. But, wait, there’s more. Before clicking the Find Camps button, you can select from a list of 20 different activities you’d like to do at camp, ranging from ATV riding to historic trails to winter sports. Doing so filters your search results to just include camps that offer the activities you’re interested in. Since today’s Scouts are all digital natives, this seems like the perfect tool to use during your troop’s annual planning conference. As you’re brainstorming destinations, you could challenge your youth leaders to use the app to research possibilities. While the app is a great tool for finding a new Scouting destination, it’s also a great way to find stopovers on the way to another destination. Let’s say your troop is driving to Philmont for a backpacking trek and wants to camp in Kansas along the way. Enter your tentative stopover point in the app, and you may find just the place to stay. Click here to learn more or download the app. One of the neat things about Scouting is how the program transcends generations. Here at the National Annual Meeting in Nashville this week, I met Andrew Miller, who–at the tender age of 32–is receiving the Silver Antelope (the highest award a region can bestow). Andrew’s great-great-grandfather attended the 1937 National Jamboree and the 5th World Jamboree in Netherlands that same year. Andrew was too young to attend the 1993 National Jamboree, so his first jamboree was the 18th World Jamboree two years later in–wait for it–the Netherlands. Generational connections like that in Scouting are cool (and surprisingly common). However, it’s safe to say that Andrew’s great-great-grandfather’s World Jamboree experience in 1937 was quite different than Andrew’s experience in 1995. And that’s a good thing. While the only person who likes change may be a wet baby, the fact is that programs like Scouting must continually change. The details of the changes are too involved to cover in a single blog post, but that’s okay. The BSA has created a special section of its website with all the details. I know that some long-time Scouters will grumble about the changes. (See the wet-baby analogy above.) But having been knee-deep in the Cub Scouting changes over the past year or so, I can assure you that they were devised by folks who live and breathe Scouting, who bleed blue and gold, and who are passionate about making sure that Andrew Miller’s great-great-children can carry on the Scouting legacy of previous generations. Build a better Scout troop, and the world will beat a hiking path to your door–but only if they know you exist. There are lots of ways to do that, of course, but one that’s free and easy to use is the BeAScout website. Rolled out four years ago, this marketing site from the BSA includes a unit locator that should make it easier for prospective members to find your troop. It’s a pretty slick tool, but there’s a catch: Your troop has to update its information through the MyScouting website. Otherwise, the only contact information that appears is for your local council. While you could rely on your local council to forward the referral, why not cut out the middleman? To update your pin, log in to the MyScouting website and look for a BeAScout link on the left side. (Depending on your registered position, you may or may not have access.) Clicking the BeAScout link takes you to Unit Pin Management, where you can customize your BeAScout listing. You’ll also find Unit Lead Management, where you can keep track of leads you receive through the site, and Membership Application Management, where you can–you guessed it–manage applications received through the BeAScout site. BeAScout offers lots more features, such as the ability to move your meeting location if you don’t meet at your chartered organization. For details, visit the BSA’s youth recruitment page, where you’ll find several related videos and PowerPoint presentations. My father-in-law, Ted Hitch, is an Eagle Scout, and one of my wife’s prized possessions is a black-and-white photo of him in his Scout uniform. Taken in the early 1940s, it’s a window into history, a priceless memento that only exists, I presume, because Ted’s mother stuffed him in his uniform, drove him to a photo studio, and had his portrait made. These days, of course, getting a photo of a new Eagle Scout is much easier. Many families have several cameras, including one built into every smartphone in the house. But someone still has to remember to take an “official” portrait. Shooting a portrait at a planning meeting gives you something that you can use on invitations, on printed programs, and during a ceremony slideshow. But more importantly, it creates a priceless memento that the Scout’s future wife, children, and in-laws can treasure generations from now. One of my current projects is working on the BSA’s new Program Planning Features, which will replace the old Troop Program Features and will offer 48 updated themes to Boy Scout troops, Varsity Scout teams, and Venturing crews. 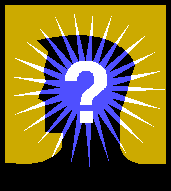 In spending a lot of time looking at meeting outlines, I’ve been thinking about an old friend: the preopening. Now, I haven’t done a comprehensive survey, but I have a feeling that the preopening–that 15 or so minutes before a troop meeting’s opening ceremony–is more or less dead in most troops. It seems like Scouts and leaders slip in the door at 6:58 (or 7:03) for a 7 o’clock meeting and move right into the meat of the meeting. It gives rank-and-file Scouts a preview of the meeting and whets their appetite to learn more. For example, if the month’s theme is hiking, you could set up a display of hiking boots and trek poles, give out samples of trail mix, or let early arrivers explore topo maps of Philmont Scout Ranch, the Appalachian Trail, or the troop’s favorite hiking destinations. It gives youth and adult leaders a chance to huddle about plans for the evening and fill any last-minute gaps. For example, if the Scout who was supposed to plan the game forgot to bring required supplies, it’s better to find out before the meeting than at the moment the game is supposed to start. The preopening is also a good time for advancement checks, Scoutmaster conferences, and games that work well with varying numbers of players. Just be sure you’re doing something that gets Scouts and adults there early and gets them ready for a productive meeting. How do you use preopenings (if you use them at all)? Post your ideas in the comments section below. Scouts learn first-aid skills in Scouting without ever knowing when they’ll need to use them. Or on whom. Last month a group of New Jersey Boy Scouts helped rescue the NBC journalist Ann Curry after she had broken her ankle while hiking. On April 5, 2014, Scouts from Troop and Crew 368 out of Berkeley Heights, N.J., were on a Philmont training hike through Harriman State Park in New York. That’s when, as Scouter Rick Jurgens told me this morning, they came across Curry. Only they didn’t know it was the Emmy-winning journalist right away.